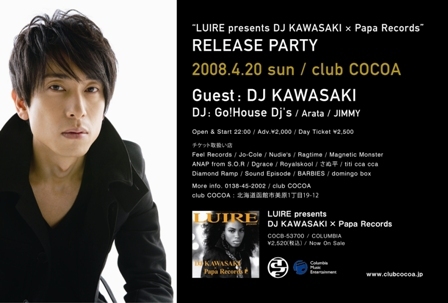 Go!House DJ No-Bitter's BLOG 4/20 LUIRE PRESENTS 『DJ KAWASAKI × Papa Records』RELEASE PARTY!! 4/20 LUIRE PRESENTS 『DJ KAWASAKI × Papa Records』RELEASE PARTY!! copyright © 2005 Go!House DJ No-Bitter's BLOG all rights reserved.